The Worst Pimp Job You've Ever Seen? I was driving through my neighborhood last night and noted my landmark for a turn onto the street that crosses mine. This landmark is a early '90s Caddy. 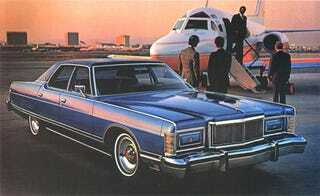 The vinyl roof is long gone. The creative owner has replaced it with black sandpaper-like friction tape. He was apparently so proud of how this came out that he carried the theme down to the trunk. In addition this car as the 'Gold' kit, performed with house paint and coarse brushes. Rusty too wide and undersized tires finish out the look of this fine machine. Which brings up the thought: What is the worst pimp out job you've seen inflicted on a helpless automobile? Living where we've lived (all over the Eastside of Los Angeles) we've seen so many horrid pimp-misfires that nothing specific is coming to mind. However, we did know a guy who was serious about getting hydraulics for his 1984 Dodge Colt. You? And the above is the best pimp job, in case you were curious.